Miracles: 32 True Stories | Narration by George! A dying child counts angels in her room. A teenage boy stuns doctors by recovering from a massive brain injury. 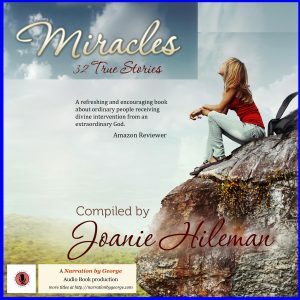 A bubble of protection surrounds a man about to be hit by a car… These miraculous accounts and twenty-nine more are recorded in Miracles: 32 True Stories. All proceeds from the sale of this audio-book will benefit See Him Ministries. The mission of See Him Ministries is to share the love of Jesus by providing humanitarian relief and development assistance to the poor of Haiti.